Your municipality works hard to meet a strict budget, and every penny matters. Municipal Collections of America, Inc. helps you design and implement a full service collection process to recover revenue from those who fail to pay their fines or debts. For over 25 years, MCA has provided collection services for over 100 municipalities across the country. 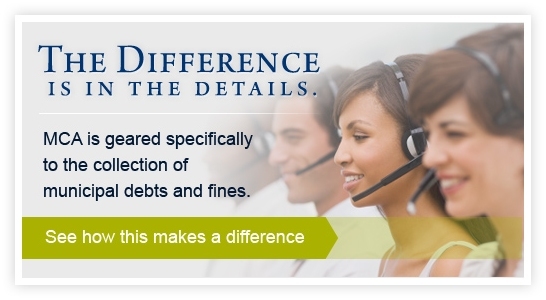 Experience recovering debts for over 100 municipalities across multiple States. Copyright © 2019, Municipal Collections of America, Inc. All rights reserved. MCA is a licensed and bonded collection agency in the state of Illinois.